Shop Competitive Mortgage Lenders with No obligation. Get more info in 30 seconds with one quick, easy form. Check Rates for Cash Out Refinancing, Fixed Equity loans and Credit Lines. Get Quotes from trusted companies with no application fees. 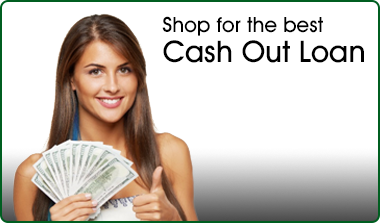 The time is right with record low rates and aggressive guidelines on loans for cash out. Nationwide will help you find mortgage companies that offer multiple opportunities to access money via refinance, 2nd mortgages and home equity credit lines. Check with the loan officers for credit and LTV standards for the cash out loan programs. You owe it to yourself when refinancing a mortgage to consider cash back opportunities because in many cases receiving money does not increase the interest rate. Take two minutes and complete the form below so that you can compare, and review offers from top mortgage companies that have a strong reputation for delivering competitive cash out refinance options. How much money in your hand do you need? Do you need all the money at once? When you pay back the money you borrow do you want to have more available to access at a later time? What is your CLTV after adding the money you need to a new loan? How long do you plan on living in this property? What is the current interest rate on your 1st mortgage? Your home is your castle, and it's likely that you are as in love with it as most people are. But aside from just being a roof over your head and a place for you and your family to spend time, it's also a major investment in your life. And as a major investment, you can certainly put you're your home to work for you financially if you need it to. See Today's Cash Out Refinance Rates. As you may already know, an equity loan doesn't replace your existing mortgage, but is instead a separate loan based on the amount of equity you have in your property. It's usually the right option for those who can't refinance or who won't' get a lower interest rate if they do. When the Federal Reserve begins raising the rates and the market changes you will see more and more borrowers opt for the 2nd mortgage. The Loan to Value standards vary from 65 to 100% depending upon credit score and income documentation. Like the 2nd mortgage, the home equity line is just a loan based on the equity in your home that subordinates to the mortgage you already have. There are two main versions of this loan – either a lump sum given to you or a kind of credit line based on value that you can draw from and use as needed. Credit lines are considered very flexible because you only pay interest on the potion used but the interest rates are variable so you have to be careful. Similar to the other cash out loan types, the LTV guidelines will range from 60 to 100% depending on the credit history, loan amount and risk factor driven by the Debt to income ratio. 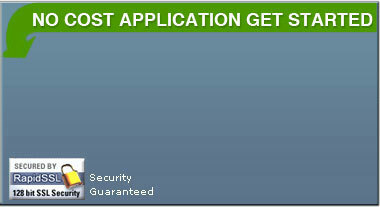 This is one of the most amazing loans because it allows cash out loans to 115% Loan to Value. 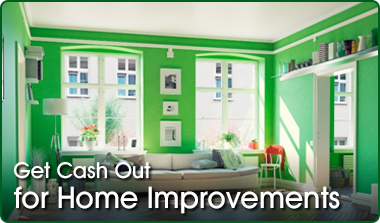 This is a program insured by FHA and was created to help people finance the costs of a home rehab and or remodeling. The Cons of this program are that there are strict guidelines for how the money is used and not everyone will be approved. Millions of homeowners’ struggle finding a cash out loan because of derogatory comments reported by Trans Union, Experian and Equifax. There are still a few cash out programs available with government, non-prime and hard-money programs. Which Type of Cash Out Loan Is Right For You? Understanding which of these is right for you depends on a lot of different things, and taking a closer look at a few basic points will help you figure out which one you should consider above the others. Here's what to consider. What is your current rate? If you already have a great interest rate on your first mortgage, refinancing probably won't do that much to help you. Instead, you should consider a home equity line or a second mortgage instead. How much do you need?Home equity and second mortgages may offer you a larger amount back, but will come with larger monthly payments. A refinance could come with better rates but lower amounts of cash for you. What is the loan for, exactly?Unless you really need to full sum all at once, a credit line based on home equity could be the perfect solution. The reason is that its interest is only based on what you've used thus far. It's much like a credit card, and is a good call for those who want some extra money but who don't need a huge amount at one time. It's also worth remembering that if you take this route, it's worth cancelling credit cards that you don't really need. The problem is that often, wiping away credit card debt leaves homeowners with a large amount of new credit space. Those cards could get used quickly and start to add up again, only now you'll have an additional mortgage on top of those monthly fees. In short, using a refinance or equity loan to pay off debt is something that is well worth considering and that could make a lot of sense for many. The key is to go about the process in the right way and to understand each aspect of what you're doing. If you'll take those basic steps, you could secure a stronger financial future for yourself. There are plenty of choices here, and the easiest solution is to talk to a loan expert about your needs and your current situation. They can usually guide you to the loan that is perfect for you and help you get the money that you need, no matter what your goals may be. Your home can be a lot of things – refuge from the world, shelter from the weather, and place for you and your family to spend time together. But it is also a major asset and using it intelligently can help give you some significant financial advantages. 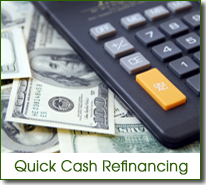 An example of this is the process of cash out refinancing. By refinancing your home and then taking a cash amount for the equity, you can give yourself a large amount of money that can be used for a huge amount of different things. You can borrow money based on equity – the amount of value beyond what you owe – and once that you have the funds you are free to spend them on whatever you like. Of course, most people have some pretty common ideas about what they want to achieve with their funds. Here are ten great reasons to consider cash out refinancing for your own home. For starters, you can use the funds to pay off your medical if they've gotten out of hand. The money can quickly get rid of medical debt and give you a clean slate. Similarly, funds from cash out refinancing are often used to pay off college debt like student loans. You can use the funds to consolidate debt, paying off your credit cards and then reducing your monthly bills to the single loan payment. Many have used the cash from cash out refinancing to help finance their new business and become an entrepreneur, moving your entire life in a new direction. You can use the funds to complete home repairs and remodeling projects, giving your home a facelift and increasing its value even more for future loans or resale. Paying for a child's education is a common use for cash out refinancing as well and can help them avoid debt from high-interest student loans. Use the funds to pay for a vacation, or to make a down payment on a vacation you've always dreamed of taking but couldn't afford. Many also use the funds to invest in the stock market and increase their wealth in that way, or at least use a portion of the loan money to start your investment portfolio. You can also keep the funds in a savings account, letting them draw interest while providing you with a kind of safety net that will give you peace of mind throughout the future. Finally, you can use your cash out refinancing money to splurge on that big purchase you've always wanted like a boat or RV and getting better rates in the process. Since interest rates with cash out refinancing are often lower than other types of loans, big purchases and debt consolidation are two very common options that are taken by those who are refinancing their home. It's well worth considering all of the options above, and if you find yourself in a situation where you need more funds, don't hesitate to consider this type of cash out loan. One of the biggest benefits of homeownership gaining quick access to cheap money. There are many ways for qualified homeowners to receive money back in their loan.